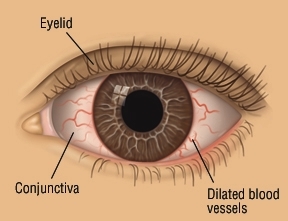 Conjunctivitis, also called pinkeye, is an inflammation of the conjunctiva, the transparent membrane that lines the eyelids and covers the whites of the eyes. Conjunctivitis can be triggered by allergies, by contact with irritating chemicals, or by infections with either a virus or bacteria. Viral conjunctivitis often is caused by one of the adenoviruses, a family of viruses that usually causes colds (upper respiratory illnesses). In temperate climates, adenoviruses are most active during spring, early summer and mid-winter. They infect fluids in the eyes, mouth and nose, and can spread from person to person on hands and in the droplets of coughs and sneezes. In most cases, adenoviruses cause only a mild case of conjunctivitis. However, they are capable of causing a more serious infection, called kerato-conjunctivitis, which can cloud the cornea and interfere with vision. Besides adenoviruses, other viruses that cause conjunctivitis include enteroviruses, the measles virus (rubeola) and the herpes simplex virus. 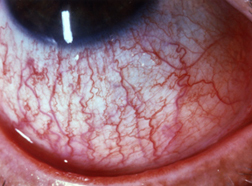 If it's viral conjunctivitis, this eye discharge tends to be thin, clear and watery. The eye discharge from bacterial conjunctivitis it is often thick, discolored (yellow or greenish), cloudy and sticky. Sometimes, the discharge is so sticky that the eyelids stick to one another. This is most likely to happen after waking up from sleep. With allergic conjunctivitis, both eyes usually are involved, itching is more intense and the eyes may swell.